It's a dream come true: Chocolate meets Cabernet! 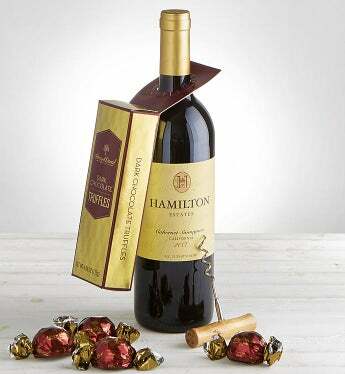 Harry & David® Dark Chocolate Truffles are deliciously complimented by our 2016 Hamilton Cabernet Sauvignon Wine. This gift also includes a classic Wood Handle Wine Bottle Opener. Great for any wine and chocolate lover. It's a dream come true: Chocolate meets Cabernet! Harry & David® Dark Chocolate Truffles are deliciously complimented by our 2017 Hamilton Cabernet Sauvignon Wine. This gift also includes a classic Wood Handle Wine Bottle Opener. Great for any wine and chocolate lover.